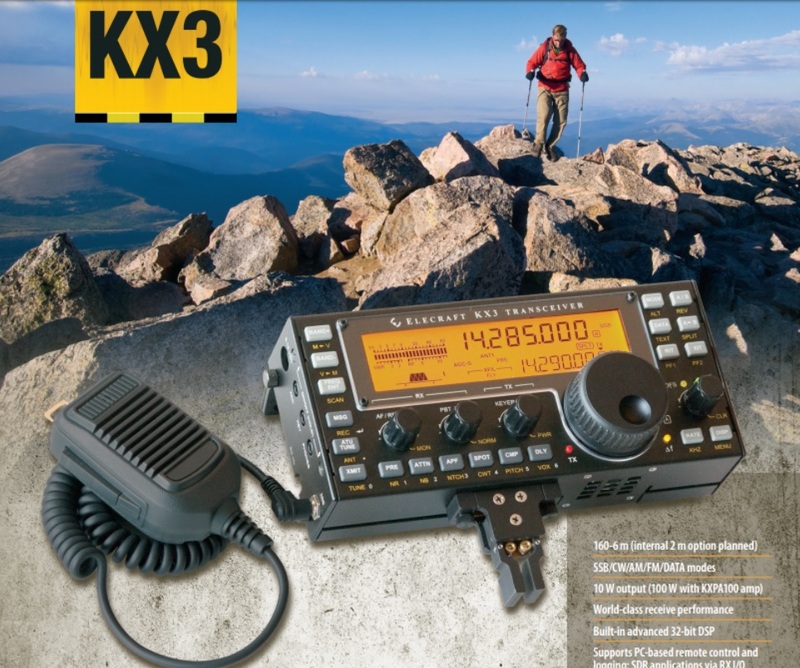 The Elecraft KX3 is a nominal 10 W HF and 6 meter transceiver intended primarily for portable use. With its internal battery compartment and available miniature keyer paddles, it is ready to go from a campsite or picnic table with just the addition of an antenna (see Figure 1). Unlike many low power radios, in addition to CW, this transceiver can operate SSB, AM, FM and digital modes. As we will discuss, unlike many compact portables, it doesn’t give up much in terms of features or performance in comparison to full-size high-end radios….. The revolutionary Elecraft KX3 puts the world in the palm of your hand! Despite its small size, it covers all amateur bands from 160-6 meters, operates in all modes, and has DSP-based features usually found only on larger radios. The KX3’s unique form-factor allows you to operate from anywhere. Fold out the rear tilt-feet for use on a desktop or picnic table. For extreme portability, you can add the internal wide-range ATU, 8-AA cell battery pack with NiMH charger, and adjustable KXPD3 keyer paddle. With a whip antenna, you can even operate hand-held. In receive mode, current drain can be as low as 150 mA – about one-half to one-third that of competing all-band portables. Transmit efficiency is also excellent, further improving battery life. The KX3 features a large front panel with all controlsoptimized for convenient use. You won’t have to dig through menus to set the power level, adjust the keyer speed, or change filter settings. And the KX3 has the same full-size display as the Elecraft K3, so all operating information is available at a glance. The KX3’s tutorial-style manual explains how and whycontrols are used, so new hams will be experts in no time. Of course you’ll also have Elecraft’s legendary customer support, and free firmware upgrades via the internet. Our high-performance KXPA100 home/mobile amplifier seamlessly integrates with the KX3 as well as other popular 5- to 10-W transceivers. It has its own internal ATU option (KXAT100) with dual antenna jacks. Announcing the new Wouxun KG-UV9D Plus Limited Edition!